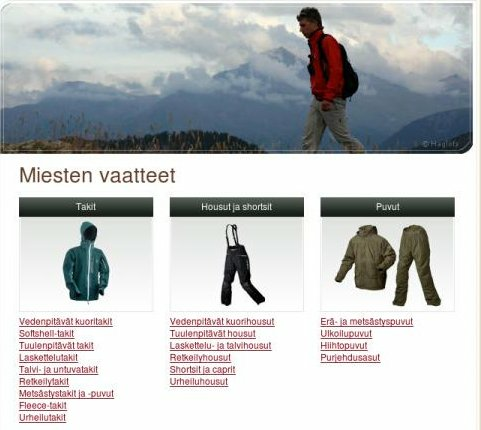 Tulos, a Finnish SEO and conversion rate optimization agency and a customer of Visual Website Optimizer did some A/B testing on its client Scandinavian Outdoor Store (an online store that sells high class outdoor clothing and equipment). Following is an interview with Tulos, where they detail just how they managed to increase conversions by 127% by doing a simple headline change. Q: Which page did you run the test? A: The front page of the product category for men’s clothing. Q: What was the conversion goal of the test? A: The conversion goal was to get more visitors to add products into the shopping cart and to have fewer bouncing visitors from the test page. Q: Which part of page did you select for the test and what variations did you test? A: We tested the variations for the headline of the page. The original headline only included the text – “Men’s Clothing”. The winning test combination included the following test (free transcription from Finnish to English) “Order Men’s Clothing easily for bargain prices”. The original version didn’t have any text under the headline. We tried adding a short block of text that included a few links to best bargain products of this product category. Q: Why did you think that the variations you created had better chances to beat the original? What were you actually testing in this test? A: We tested how the mention of bargain prices affected the bounce rate and engagement to add products to the shopping cart. The original version did not have any text about the bargain prices on the front page of this product category so it was quite obvious that this test variation would have a great impact on the performance. Q: What results did you get? Were you surprised by the results? A: The variation that included more selling headline and bargain text outperformed the original version by having a 127% improvement against the original plain version. Q: Any lessons which can be derived from your test? A: You shouldn’t underestimate or rule out the value of great text content on product category pages of online stores. Q: How valuable was Visual Website Optimizer for this test? A: VWO was a great and easy to use tool for setting up the A/B test without any technical installation issues. I know Google’s a/b testing tool, website optimizer but it looks difficult to set up the code.